The firm's webcasts will include ethics based leadership strategies, human resource technical management information, employee and labor relations strategies and training and organizational development tools. 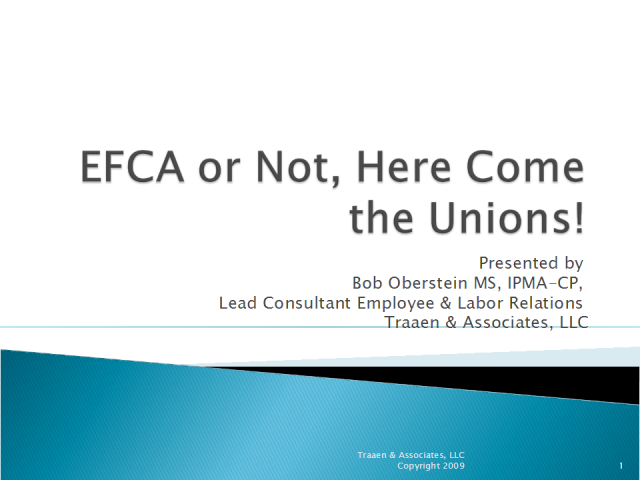 EFCA or NOT: Here Comes The Union!! This webcast will cover the realities of the proposed Employee Free Choice Act (EFCA) that is now under debate at the federal level. Regardless of the political outcome on Capital Hill in the future, the impact of this proposed legislation is significant and will continue to impact the American workplace in a variety of ways. Is your organization ready? If not, what must you do to be ready for the changes that lie ahead? Join this session for an overview of best strategies and practitioner methods for handling this issue in your organization. This session will cover the ten crucial decision points for managing employee performance. In addition, the session will provide key methods for moving an organization to a position of sustained high performance through its key talent. This session will include the top ten tips that create and sustain high employee motivation in an economic downturn. Despite the large numbers of unemployed individuals in the U.S. marketplace at this time, no organization wants to run the risk of losing their top talent. These tips are immediately usable within all work settings.